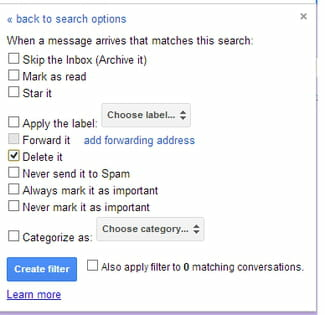 Gmail doesn't provide any real blacklist function, but instead provide several filters to block unwanted emails. Indeed emails from unwanted senders are redirected to the trash. Click on the small arrow button located to the right side of the search bar. In the From field enter undesired e-mail address. You can also block entire domains (@domainname). Click on Create filter with this search. In the new window that opens up, select the "Delete" action. As from now, emails sent from the define address will be automatically deleted. Published by jak58. Latest update on December 5, 2013 at 05:10 AM by jak58. This document, titled "Gmail: How to create a blacklist?," is available under the Creative Commons license. Any copy, reuse, or modification of the content should be sufficiently credited to CCM (https://ccm.net/).